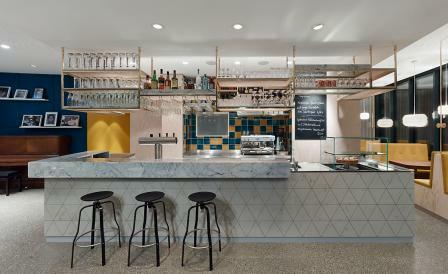 When the town of Ostfildern, a peaceful suburb of Stuttgart, approached local architects Ippolito Fleitz to remodel the popular Café Pause in the town’s centre, they were adamant that the venue was given a new lease of life to inspire a fresh, sophisticated direction. Intended for use as an arts space for a nearby musical academy or theatre companies as well as its previous function as a casual eaterie and meeting place, the new interior design combines facets of modernity and a cosy, local feel, centred around a striking circumferential, upholstered bench encompassing two existing columns and facing a gleamingly smooth marble bar. Freestanding tables and chairs are easily shifted to create performance space, and while the interior is blessed with both scope and natural light, diner-style seating and banquettes restore that all-important cosiness for enjoying a weekly-changing menu of Mediterranean-influenced dishes and regional specialties like tender tafelspitz (slowly simmered top round of beef) served with an invigorating horseradish sauce.